The fact is, we can’t, none of us. At least not by eye, and not even when using a 10x loupe. But that doesn’t mean we shouldn’t be vigilant, especially if we truly prefer our diamonds to be completely natural. But this is where the problems really start. Because synthetic diamonds are completely natural in composition. Notice we say “in composition” because, of course, synthetic diamonds don’t come from the earth and don’t need to be mined. Instead, synthetic diamonds – also often referred as cultured or lab-grown – are created in laboratory workshops using heat and high pressure to produce truly flawless diamonds. These are, in effect, exactly the same processes that produce mined diamonds, just in a very much more controlled and easily repeatable environment. All diamonds are 100% carbon, whether mined or synthetic, with identical mineral compositions, and differ only in the flaws and inclusions they either do or don’t contain. A synthetic diamond will resemble a completely flawless mined diamond in every way, and without the right – very expensive – equipment, it is impossible to tell one from the other. Because of the needs to separate the two varieties, the Gemological Institute of America (GIA) require synthetic diamonds to be indicated as so on the certificate that is issued when the diamond is graded. To some people, this may not matter as they might consider a diamond to be a diamond, plain and simple. To others, knowing the diamond in your engagement ring is mined and not created in a lab might be a a very important consideration. Mined diamonds take – wait for it – between 1 and 3 billion years to be formed and are subject to expensive extraction and cutting costs to get to market, whereas synthetic diamonds can be created in a matter of months. You’d think, then, that synthetic diamonds would be a fraction of the cost of mined diamonds, but you’d be wrong. Although cheaper, synthetic diamonds still run to between 60% and 80% of a comparable mined diamond, and there will always be that tick in the box on the certification form that could affect the resale value. At this point, we should probably make the distinction between synthetic and simulated diamonds. Synthetic, as we’ve seen are lab-grown and are absolutely genuine diamonds, but simulated diamonds aren’t diamonds at all. They are, instead, other materials processed to resemble true diamonds. The most common of these, and one which will be familiar to a lot of people, is cubic zirconia. CZ is visibly similar to a diamond, but a long way from identical. Its primary appeal is that it is cheap to produce and will, without a reasonably close inspection, pass for a diamond. It is a common stone used in cheaper jewelry pieces, and is always visibly flawless. When mined diamonds are formed, minute traces of other elements end up in the carbon lattice, such as boron or nitrogen, and these create the colors often found in diamonds such as blue or yellow. 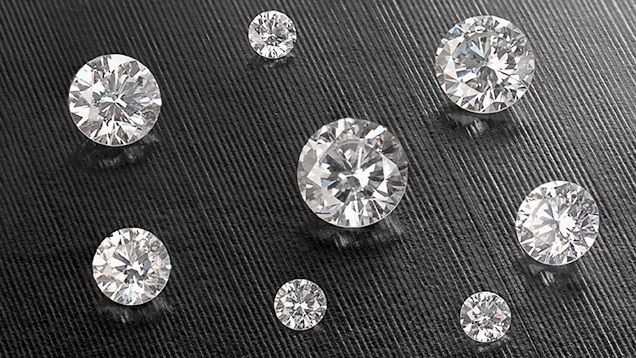 Lab-grown diamonds don’t have this “problem”, and so are absolutely colorless. So is there a practical way for someone to check whether a diamond is mined or synthetic? It depends on whether you have about $40,000 lying around to purchase a machine capable of telling the difference. In such machines, there are tell-tale signs of whether a diamond is synthetic or not. In one such test, synthetic diamonds will fluoresce orange, whereas mined diamonds will fluoresce blue. Otherwise, we’re mostly at the mercy of the integrity of the dealer and/or the certificate. One or two synthetic diamond producers have started to put a microscopic laser etching on their products to indicate it is synthetic, but this is the exception, rather than the rule. We always advise that diamonds should never be bought without seeing the original GIA certificate, and the increasing popularity of synthetic diamonds merely emphasizes that advice. Use a dealer that is affiliated to a known trade body and, if in doubt, get a second opinion. Synthetic diamonds are beautiful, make no mistake about that but, well, we can’t help feeling that a mined diamond just has a little more appeal, flaws and all.